Drawing on his curiosity for this one-of-a-kind blend, winemaker Christophe Paubert experimented with two varietals that have a rich and natural lineage with the Stags’ Leap estate – Cabernet Sauvignon and Petite Sirah. Typically, this unique convergence of varietals would be overpowered by Petite Sirah’s peppery and floral, bold nature, but Christophe took a particular liking to a block on the Estate that seemed to transcend the varietal’s classic characteristics. Block 9 maintains the wonderful, highly concentrated black fruit flavors and power that are beloved of the varietal without the dominant spice and floral notes. This allows the Petite Sirah to be a wonderful counterpart to Cabernet Sauvignon, extracting power, richness and elegance from the varietal without diverting Cabernet from its essence. This truly unique blend of Petite Sirah with hand selected lots of the Estate’s most distinctive Cabernet pushes the assemblage to a new level of power and concentration while still maintaining the winery’s signature touch of elegance. For Christophe Paubert, winemaker and general manager at Stags' Leap Winery, the identity of a wine is found through the terroir. Christophe's career has spanned the industry from sales to winemaking, and his impressive background includes positions at Chateau d'Yquem and Gruaud-Larose as well as projects in Chile, Spain and Washington state. But it was the terroir of Stags' Leap that drew him to California. 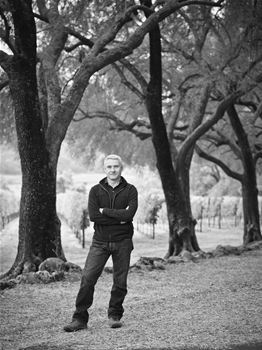 "I believe that wine should express the uniqueness of the land, and the Stags' Leap wines have always showcased one of the most distinctive regions in the Napa Valley." Christophe grew up just outside of Sauternes in Bordeaux, where his grandfather was a cellar master. He spent his childhood immersed in the culture of wine, and followed his love for wine and science to the Institut d'Inologie in Bordeaux. He graduated in 1983 and spent three years working for a negociant in Bordeaux before returning to complete a two-year graduate course in sales and marketing. Upon graduation he took a job selling winemaking equipment, enjoying both the challenge of sales and the technical knowledge required. After seven years, he decided it was time to start making wine again. While visiting some friends at Chateau d'Yquem, he was offered the job of cellar master. His position encompassed everything from guiding tours to making the wine. "I was very passionate about this job because Sauternes is part of my culture; it was an exceptional thing to touch this unique wine." Nearly four years later a new opportunity arose. Christophe was offered the chance to travel to Chile, build a winery, hire and train a cellar crew and overhaul a 400-acre vineyard. "This is something that you do once in your life, it was so dynamic. I knew very little about viticulture at the time. It was a great learning experience and very rewarding to see the results." During this time, he also traveled to Spain to learn the nuances of Tempranillo, and made wine in Rueda, Rioja and Ribera del Duero. Stints in Navarra, Spain; the Medoc in France and New Zealand were to follow and the jobs included everything from running the lab to improving vineyards and making wine. "You never stop learning. I have done every job there is to do at a winery from running the lab to giving tours. Every single person has an important job, and my role is to connect everyone to the greater purpose." Most recently, Christophe spent four years in Washington State at Canoe Ridge, making Riesling, Chardonnay, Cabernet Sauvignon and Merlot. Christophe's winemaking philosophy is informed by the sum of his varied experiences. He makes wine the way he learned in France, to showcase the fruit and not the winemaker's hand, but he applies a technical understanding of each and every step of the process. "Wine is culture. There is history and tradition behind it. You enjoy it on the table with food and good conversation, and making wine involves working with other people."